It was a rough start for the Cleveland Indians in the series opener against the Oakland Athletics, but they bounced back after trailing 3-0 in the sixth inning and pulled out a 5-3 come-from-behind victory in front of 33,000-plus fans at Progressive Field on Friday night. Oakland got on the board after three scoreless innings, as Billy Butler drove in Josh Reddick, with an RBI single. Reddick reached base earlier in the inning on a throwing error. The run was not charged against Trevor Bauer’s earned run average. Both sides were kept quiet for the next two innings until Oakland struck again, thanks to back-to-back home runs from Reddick and Kris Davis, making it 3-0 and ending Bauer’s outing. Carlos Santana answered back in the bottom of the sixth, belting his 22nd home run of the season to right field to put the Tribe on the board and cut the deficit to two. Just as Oakland capitalized on an error in the fourth inning, the Tribe took advantage of one in the bottom of the seventh, as Rajai Davis reached base with one out, sparking a rally. 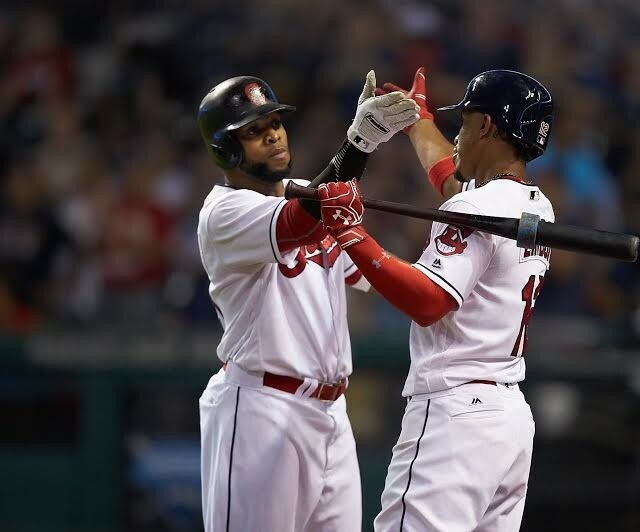 Back-to-back singles by Tyler Naquin and Abraham Almonte, who entered the game to pinch-hit for Chris Giminez, would drive Davis home and set up runners at the corners with one out for Santana and the Tribe down 3-2. Former-Indians LHP Marc Rzepczynski would enter the game to relieve Kendall Graveman, and Santana would draw a walk, loading the bases for Jason Kipnis. Kipnis would drive in Naquin to tie the game at three, ending Rzepczynski’s short outing and setting up a bases loaded situation for All-Star shortstop Francisco Lindor to face right-hander Ryan Dull. Dull would cost his team a run, as a wild pitch brought Almonte home from third to give the Tribe a lead, moving the runners to second and third. Lindor would drive in Santana with a sacrifice fly to make it 5-3 Tribe with two out for Mike Napoli. Napoli would strike out to end the inning, but the damage was done, as the Tribe picked up four runs in the inning, two of which came via an error and a wild pitch. Bryan Shaw worked a 1-2-3 eighth inning to keep the Tribe ahead by two. The Tribe threatened in the bottom of the eighth, but was kept off the board, and closer Cody Allen would enter to work the ninth inning with a two-run lead. Allen struck out Lowrie, making Reddick the last hope for Oakland. The Tribe closer would seal the deal, as Reddick flied out to the warning track in center field. Allen would strike out the lead-off man to start the top of the ninth, but gave up back-to-back singles, putting the go-ahead ran at the plate as Jed Lowrie stepped up to bat. It was a no-decision for Bauer, who allowed two earned runs on five hits over 5.1 innings, striking out four and issuing two walks. Cody Anderson earned the win, improving to 2-4 on the season with a 7.09 ERA. Graveman took the loss, falling to 7-7 on the season. It was 3.2 innings of shutout relief from the combination of Dan Otero, Cody Anderson, Shaw, and Allen that kept the Athletics off the board from the sixth inning on, a pleasant sign from a bullpen that has struggled throughout the season. The last time a team from Oakland faced a team from Cleveland, it was the 2016 NBA Finals, when the Golden State Warriors became the first team to blow a 3-1 lead in NBA Finals history. Perhaps it’s something in the water in the Bay Area, but the Athletics committed a similar collapse on a smaller scale on Friday night. The Indians maintain their 4.5 game lead over the Detroit Tigers for first place in the American League Central Division, improving to 58-42 on the season. The A’s fall to 47-56. The two teams are back at it on Saturday at 7:10 p.m. ET, as Josh Tomlin (10-3, 3.48) takes on Dillon Overton (1-1, 8.40).